Omega's NS Series enables operators to reach the devices on the network including special I/O units, intelligent devices, and PLCs. 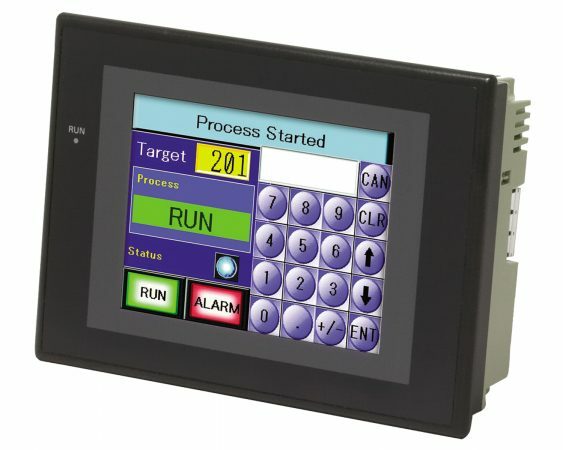 The Omega NS Series touch screen HMIs offer built-in Ethernet communications, alarming/recipe/data logging capabilities and live video input/display capabilities. By allowing direct resetting of faults, these HMIs save time and effort in troubleshooting and quickly return your lines to production. The NS Series achieves flexible data access to a variety of devices. It enables operators to reach the devices on the network including special I/O units, intelligent devices, and PLCs. Preprogramming function blocks allow for easy drag-and-drop into a program, just specify values for key parameters. The built-in Smart Active Parts library lets you establish communications and parameters for a wide range of products. Just select the product and drag its icon into your project and it automatically sets the correct protocols. A device monitor function that enables monitoring the PLC I/O data required for device maintenance and debugging is included as a standard feature. Ladder monitor lets you monitor PLC program status, search for addresses or instructions, monitor multiple I/O points, and much more. It only takes about 5 seconds to switch from a user screen to the ladder program monitoring screen.